The Italian product tanker Rinella M caught fire at the dock in Port of Alexandria, Egypt. The accident occurred during offloading of some 9,000 tons of gasoline and the flame spread to the cargo deck. Crew was unable to get control over the flames and immediately reported the accident to the local authorities. Cargo transfer to the shore was stopped immediately to prevent spreading of the flames. The local authorities sent hazmat and firefighting teams, which started firefighting. 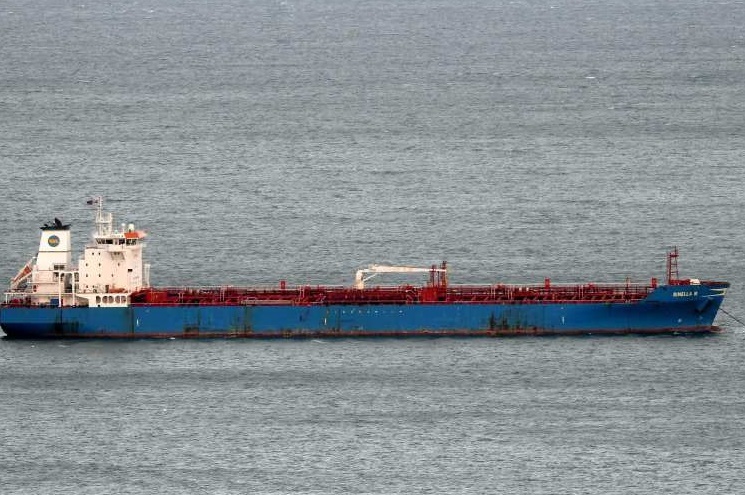 There is no additional information about the crew and vessel’s condition and also the quality of the gasoline remaining on board of the tanker. The root cause of the fire is unknown and under investigation. Also it is not clear if vessel was unloading gasoline to the shore tanks during the accident and if cargo transfer was completed. There are no reports about injuries and water pollution. The product tanker Rinella M (IMO: 9351529) has overall length of 180.00 m, moulded beam of 32.20 m and maximum draft of 8.70 m. The deadweight of the vessel is 40,416 DWT and the gross tonnage is 25,804 GRT. The vessel was built in 2006 by Santierul Naval Constanta shipyard in Romania.